1955Born in Aizu-wakamatsu, Fukushima pref in Japan. 1969Begins lure fishing and lure making. 1974Produces the first original minnow HMKL. 1977Visit Texas, USA to train bass fishing for 1 month. 1983Joins Jerry McKinnis Charrity Tournament in Arkansas, USA. 1986Wins the SHIMANO Japan Cup. 1986Wins the Eastern Japan Open Tournament for the total weight. 1986Named angler of the year by JBTA. 1987Joins Bass Invitational in USA. 1991Returns to Japan after 4 years in USA. 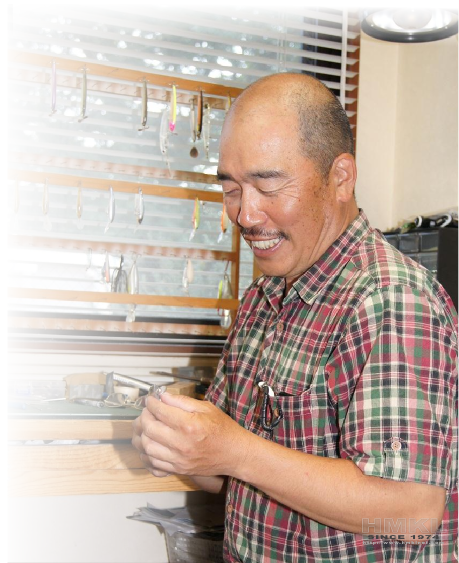 1992Named angler of the year by Lake Tsukui Open Tournament. 1993Named angler of the year by Lake Tsukui Open Tournament. 1997Wins JB World Series 1st. 1998Ranks 5th overall in JB World Series. 2000Ranks 4th overall in JB World Series. Copyright © 2000-2019 HMKL Inc., All Rights Reserved.